I’m so nervous!! 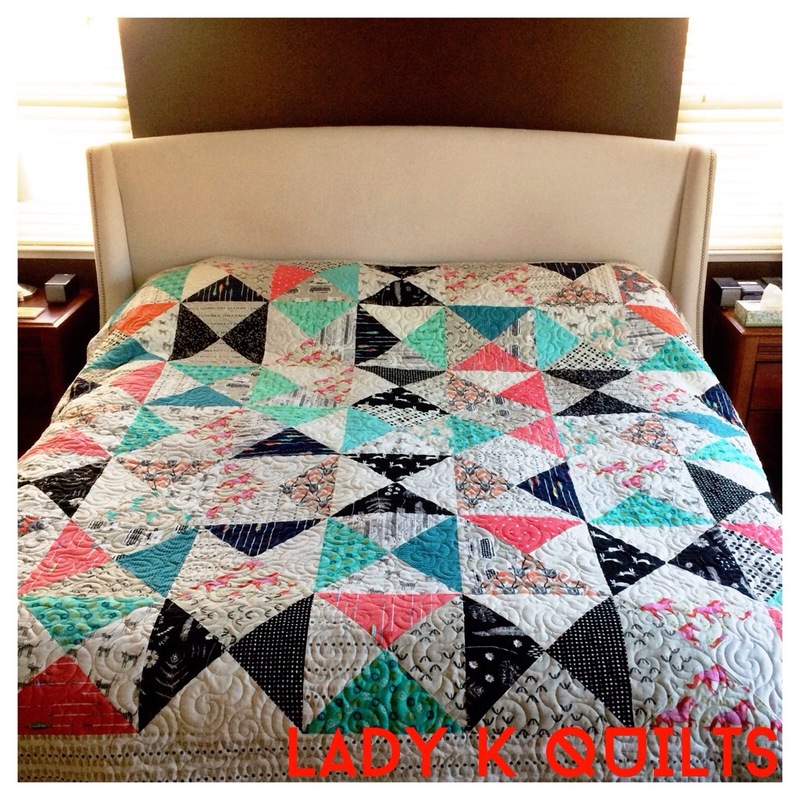 I am entering two quilts in the Spring 2015 Blogger’s Quilt Festival over on Amy’s Creative Side. If you are visiting me here for the first time because of your interest in the festival, “Welcome!” You can find much more of my work and thoughts over on Instagram. The link is there on the right. 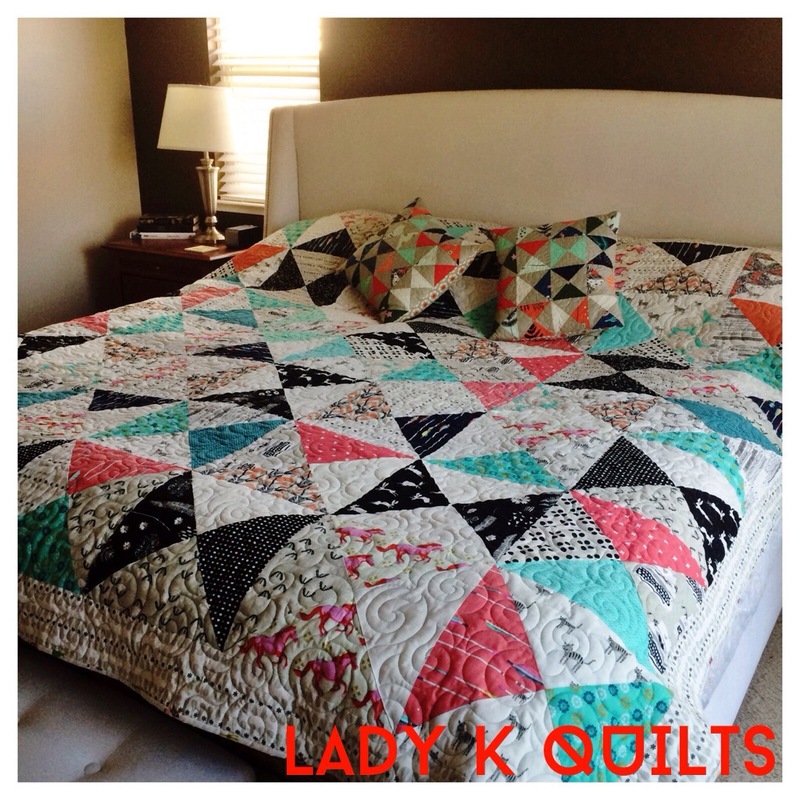 The first quilt I am entering will be in the LARGE QUILT category. It measures 93″ square, 372″ around. My friend Anna aka @HootnHaller and I challengecd ourselves to actually make some things out of the many quilt books on our shelves. This is my first finish and I couldnt’ be happier. I call it “Menagerie” because of all of the animal prints throughout the top and back of the quilt. It is made up of entirely all Cotton + Steel fabrics. Of course I used 50 weight Aurifil thread to piece it and to sew the binding down. I finished piecing it last week. After piecing the back, I delivered it to my local long arm quilter, JoAnn Sholtz, and had her use a beautiful turquoise colored thread to quilt the dense “Deb Swirl” pattern all over it. I was so excited to pick it up from her yesterday, Monday, that I ran right home, made up the binding, machine stitched it onto the top and then spent 4.25 hours hand stitching the binding to the back whole watching The Voice & DVR’d The Bachelorette. And then… I slept under it! Hubby and I just love it and were amazed at how nicely it fit on our king sized bed. The pattern is called “Breaking Tide” by April Rosenthal. 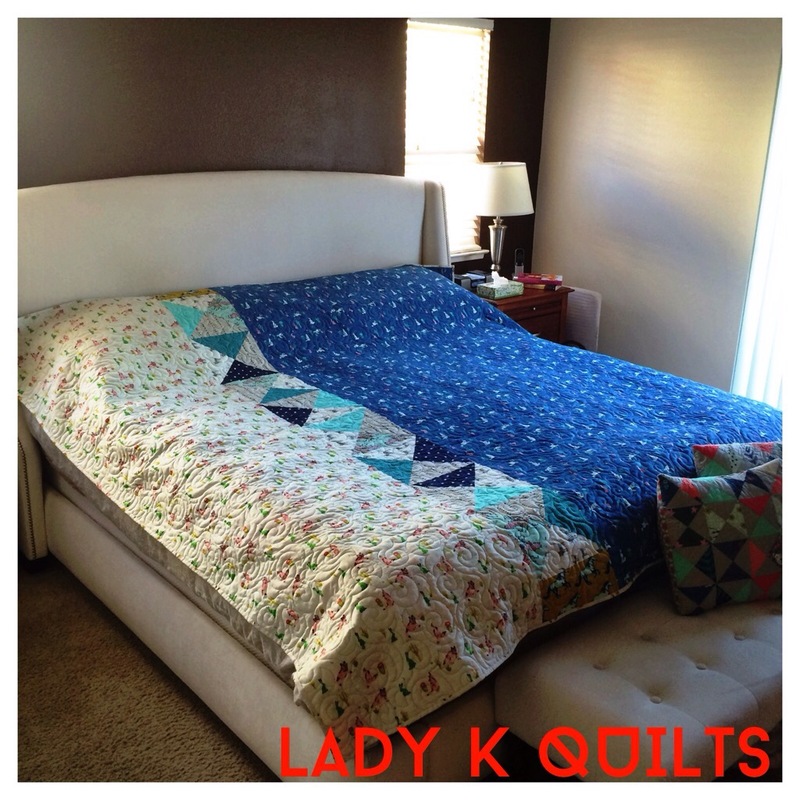 It’s the second pattern in her book, “Bedroom Style, Perfectly Pieced” from Lucky Spool. I designed the back of the quilt using 10″ quarter square triangles to reflect the quilt top, and used two color ways of the coyote and rabbit print from Cotton + Steel’s “Mesa” collection. I honestly don’t know which side I like the best! Well, thank you so much for stopping by and checking out my quilt. 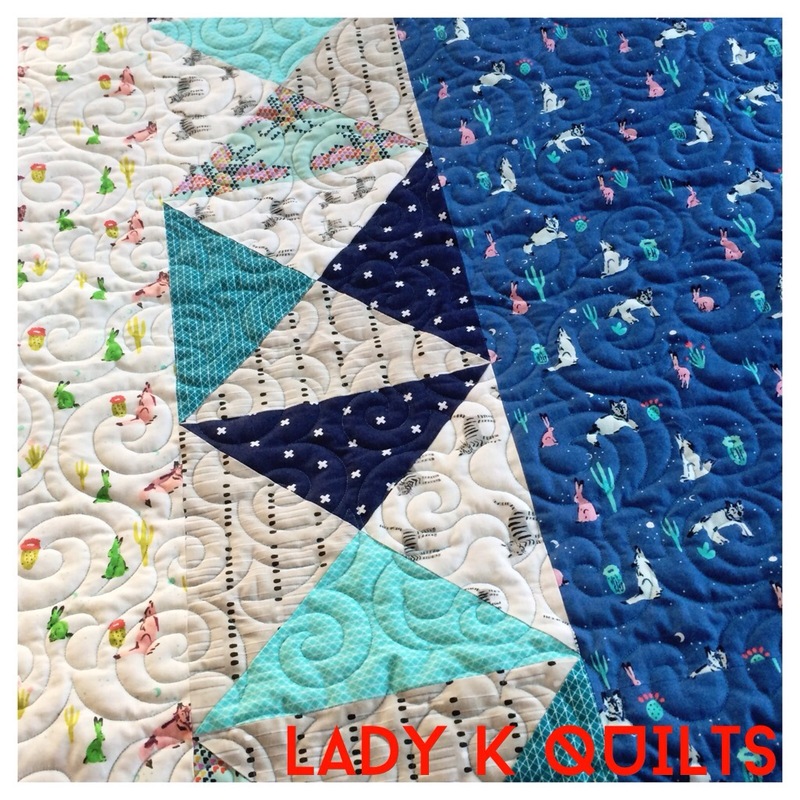 To those of you who have also entered the Blogger’s Quilt Festival, good luck! Thank you to Amy of Amy’s Creative Side for providing such a fun platform to share quilts in. So beautiful! Good luck!! Great Quilts, especially the first one. Of course I mean the top, I like the top´s design best….